Kim Richards can finally join the "Housewives" plastic surgery club! This season on the "Real Housewives of Beverly Hills," Richards debuted her brand new nose, a procedure she had done during filming. But more amazing than her new nose (which does look pretty great) is the fact that she opted for no pain medication during recovery. Kim's battled with substance abuse and addiction in the past, but in the last year she's maintained her sobriety -- and didn't want to risk falling off the wagon. Assessing her sobriety, her plastic surgeon Dr. Grigoryants tells toofab "I do have patients in general that have alcohol abuse history, or drug abuse history, and before surgery we make sure we are a 100 percent clear that they are clean and haven't used at least 5 or 6 months prior." Dr. Gregorian also noted that a nose job isn't as painful as, for example, a breast augmentation, though the bruising can be much worse. For some, pain medication isn't even needed. Kim opened up to toofab about her post-surgery recovery, saying she believes her lack of pain was nothing short of a miracle. “I never really had very much pain at all – and when I saw what I looked like on camera I was like ‘I look so bad’ but I just never had much pain," she says. "I kept it iced, but the pain never really happened, it never really hurt. I was just very relaxed. I didn’t even have very much bruising." Richards added, "He [Dr. Grigoryants] would say I might have some pain and bruising the next day and it just never came, almost like a miracle -- a blessing from above. I just didn’t have that experience [like everyone else]. He does them every day and said he’s never seen anything like this before. My bandage even fell off because there was no swelling. I just did everything he told me to do prior." While Kim left the look and shape of her nose in the hands of Dr. Grigoryants (with only the desire to have her bump removed), other clients of the well-known plastic surgeon will often request a nose similar to some of our favorite celebs. "They will bring me a photo of Kim Kardashian's nose and Angelina Jolie's nose -- they're the most frequently requested. You know, there's a lot of things they have to keep in mind ... you may not have the most beautiful nose but if it's a beautiful face, the nose makes a difference," Dr. Grigoryants told us. But realistically speaking, the Dr. noted that you can't take someone's nose and expect to replicate that exact look on your face. Dr. Grigoryants also told us that the most important factor (obviously besides Board Certification) is to find a surgeon who has a lot of experience. "If I wanted plastic surgery myself or for my relatives, I would want somebody who does a lot of procedures. I would want a surgeon who does a lot of rhinoplasties and has a lot of experience. It's a more predictable outcome," he told us. 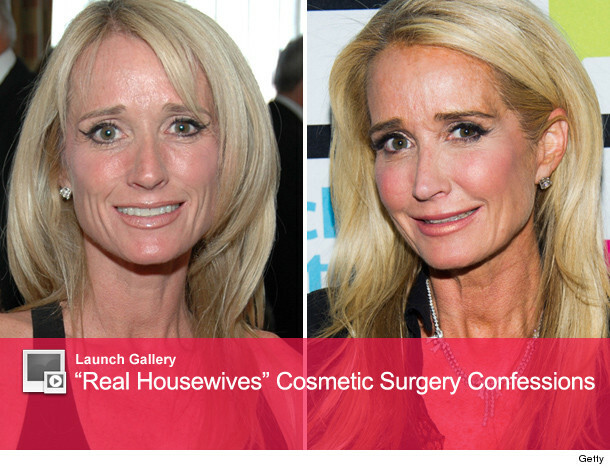 Click "Launch Gallery" above to see more "Housewives" who've been under the knife! Lisa Vanderpump & Kellie Pickler Flaunt Hot Bods for "DWTS"
Kandi Burruss Suing Kim Zolciak Over "Tardy For The Party"